Referring to the above, Zeynalyan said: “I was thinking of not responding to false posts, but ignoring them, in this case, gives some people the opportunity to spread their lie on a larger scale. Dear friends, I have not come up with any legislative initiatives to amend the Criminal Code neither this week, nor last month, nor after my appointment at all. This campaign launched in the social domain is absurd and groundless.” Only a day later he added this note on the post: “All inappropriate, obscene, discriminatory, and hateful posts in the comments will be deleted. Thank you very much”. This campaign launched in the social domain is absurd and groundless.” Only a day later he added this note on the post: “All inappropriate, obscene, discriminatory, and hateful posts in the comments will be deleted. Thank you very much”. 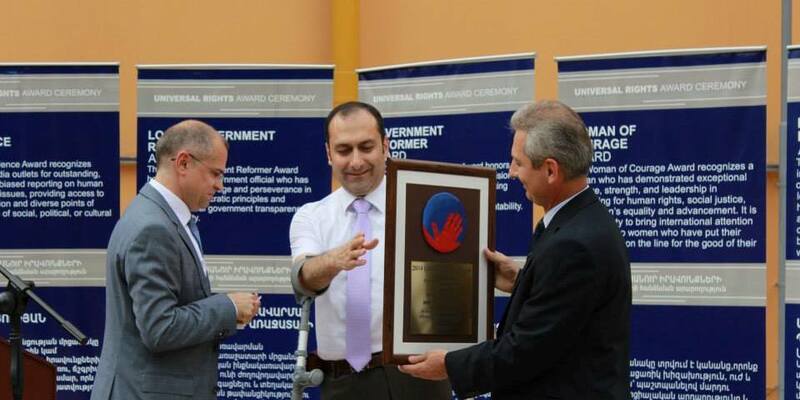 Artak Zeynalyan, previously engaged in human rights activities, has made efforts to eliminate discrimination in the country and has assisted in the elaboration of legislation against any kind of discrimination. Moreover, the adoption of the law prohibiting discrimination was Mr. Zeynalyan’s New Year wish for 2016. RA does not have problems with the legalization of homosexuality. Over the past fifteen years, homosexual relations have not been criminally punishable in Armenia. 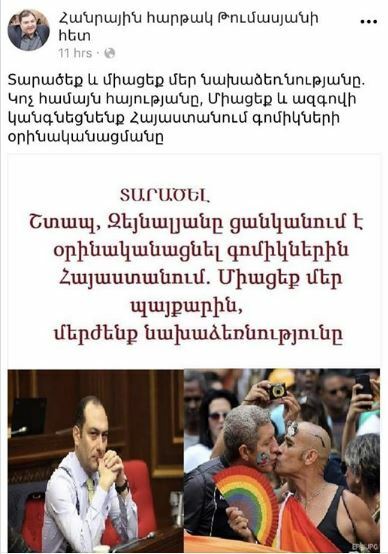 The post contains insulting and discriminatory expressions, which is unacceptable both in terms of the Constitution and Human Rights and from Artak Zeynalyan’s point of view (as we can suppose by the part added to his post a day later). We believe that it would be good for Zeynalyan to mention that in his original “denial” post. It should be noted that though the draft of the new Criminal Code is not Artak Zeynalian’s initiative and is put into circulation in 2017, it is now in the phase of elaboration. Criminalization of discrimination based on sexual orientation stems from the priorities of the realization of human rights in Armenia as well as the commitments and international recommendations of Armenia. We call on Artak Zeynalyan not to go against his principles and respond adequately to materials containing discrimination and hate speech, never forgetting that the highest value in the Republic of Armenia is the human, their fundamental rights and freedoms, and should be the political priorities of all state officials.